We always begin with a personalized consultation to bring out your best skin! Your skin is unique, so every facial is customized to meet your needs - from dry, oily, acne to dealing with aging issues. Starting with cleansing, then a mini lifting peel, followed by light extractions and custom massages then a soothing mask to completes this treatment. 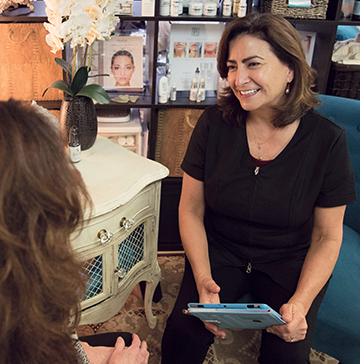 Starting with a customized consult, we’ll work together on a skin care plan to get you feeling and looking your best! The microcurrent emits low-voltage electrical currents to repair and stimulate collagen and elastin. Microcurrent is a clinically tested therapy treatment that uses a low-levels of electricity that mirrors the body’s own natural electrical currents. Using Microcurrent therapy enhances the production of natural collagen and elastin, increases ATP production (which is the fuel of your cells), provides circulatory benefits, and assists in product penetration. The result is immediate firming, smoothing, and re-hydration of the skin while greatly reducing the appearance of fine lines and wrinkles. Microcurrent is also referred to as facial sculpting treatment. It can lift, sculpt and tighten any part of your face. This procedure is non-invasive. You’ll look and feel prettier walking out than when you walked in! This features a safe and very effective hands-on technique that involves applying gentle sustained pressure. This is not your typical facial massage. This treatment will have you forgetting about the world outside. It includes slow structured releases of fascia to elongate muscles back to where they need to be. It’ll ease tension where you never realized you had it! You will enjoy a deep relaxation state while I work away the stress of sitting at a computer or desk. This will help you feel more relaxed than you ever thought possible along with a lifted and toned face. Radio Frequency uses electrical energy for skin tightening, is non-invasive and has almost no downtime. • DMK Enzyme Firming Mask aka, “Game of Thrones mask” - Popularized by the favorite dragon-filled TV series, this mask is like no other skin treatment. Starting with deep cleansing and exfoliation, an enzyme mask is applied and as it dries, removes dead skin and toxins, stimulates circulation and collage production, helps with inflammation along with bringing oxygen to skin. Afterwards, a calming serum mixture finishes the treatment. Skin feels refreshed, revitalized and vibrant! Levels 1, 2, and 3 are customized for each client’s treatment plan with home care. • Radio Frequency - Used for effective skin tightening treatments suitable for both face and body, tightening loose skin on necks and jowls areas. It’s non-invasive treatment resulting in wrinkle reduction, skin tightening and overall skin rejuvenation. This is an ideal treatment when packaged with microcurrent for tighter finish. • SWiCH Dermal Rejuvenation - This treatments goes beyond peels and restores skins youthful appearance. This natural repairing system makes the skin more active. Unlike peels, that just work the surface, this system penetrates into the skin to switch on the energy needed to repair from within. • Peels and Deep Exfoliation - A treatment is offered for scars, pigmentation, etc. Thirty minutes later, you've got eyelashes that look darker, fuller, and curvier. A specialized treatment that uses your natural lashes with lash lifting serum that gives a natural brighter lift. No need for eye lash curling for 6-8 weeks! Tints are included for a more intense eye look with mascara. Gua Sha, featured on left, and Kansa, on the right, are two result-positive treatments that employ skillful massage techniques on specific areas to reduce tension and improve skin elasticity. Gua Sha is a holistic skin therapy that uses a specialized massage tool that gently but purposefully glides across your scalp and face areas. This ancient Chinese technique uses short strokes to stimulate microcirculation of soft tissue and increase blood flow. Some clients find mild pain relief and look more youthful from release of tension after applying this smooth-edged tool. Kansa is another massage tool, a metal wand popularized in India, that offers skin revitalization, softer fine lines and de-puffs the eyes while firming the jawline and cheekbone areas. The soft rolling massage aids in lymphatic draining and the small circular movements over the forehead, brow bones and temple area help release tension and tightness.